Aspen Camp is an ideal adventure camp for perfect holidays in the foothills of Nainital. Situated on the laps of mother nature, the camp is surrounded by pine trees and offers scenic valley views. With adventure filled camps and warm hospitality, the camp is best place for family holidays, corporate outing and adventure enthusiasts. The camp is located at 17 kms from Nainital on Kaladhungi road. Along with Jim Corbett Park and Nainital sightseeing, Jim Corbett Museum and Corbett Falls are some best places to visit from the camp. The camp offers well appointed 17 luxury cottages which are filled with modern amenities and has attach washrooms with hot/ cold water. 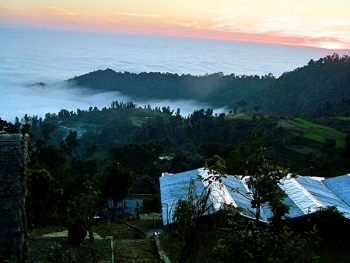 Each camp has living area of 12X12 feet and open sitting space to view the scenic beauty of the hills. The camp has an open air restaurant serving India, Continental and local Kumaoni cuisines. The High Teas by the Sunset Point is a live Bar-Be-Que offers delicious snacks. The tents are available at INR 4000/- per night. The resort can be reach via Nainital or Kaladhungi. It is located at 17 kms from Nainital and 20 kms from Kaladhungi. It is well connected by metalled roads to Nainital, Kaladhungi, Haldwani, Ramnagar, Kashipur and Delhi. One can board direct bus to Haldwani, Nainital and Ramnagar from ISBT Anand Vihar Delhi. After then one can hire taxi to the camp. Nearest railway stations are available at Haldwani (42 kms) and Ramnagar (49 kms). Pantnagar airport is the nearest domestic airport located at 70 kms and international airport is IGI Airport at Delhi.